When it comes to learning about the Freedom Debt Relief program, reviews from real FDR clients can be really helpful.Read more After all, they struggled with debt just like you, and they had some of the same questions and concerns you have now. Our main website offers details on how our program works, but we don’t want you to choose Freedom Debt Relief based only on what we say. Listen to what our clients say to see if FDR is right for you. After losing her job, Nicole had to use credit cards more and more. Once her debt became too much to deal with alone, the FDR program helped her get out of debt and learn better money habits. 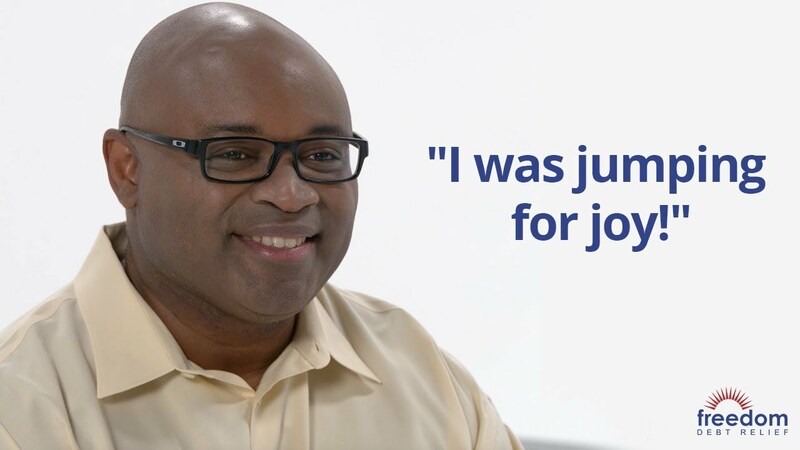 Although he was skeptical of debt relief programs, Demond changed his mind after talking to us. Since then, our program has helped him put his debt behind him. After a job loss caused her family to fall into credit card debt, Brittany chose FDR because we laid out all her options and gave her time to think. Working two jobs wasn’t enough once Mary Kate faced unexpected medical costs. Our program took the debt stress off her shoulders and helped her make a fresh start. Tens of thousands of FDR clients have written reviews about their experience with us on many popular consumer review websites. While every client’s experience is unique, these reviews could give you an idea of what to expect if you enrolled in our program. Freedom debt relief has gotten started on 2 out of 3 settlements for me. I'm so grateful to the Freedom Debt relief team. They are saving me a tremendous amount of money! I was buried in debt and couldn't pay my way out. They are taking care of me. I am now paying less than half of all those things every month and it is giving me peace of mind. I am very happy with it. This program is excellent. Had my first settlement is a month and a half. The payments are half of what I was paying. Freedom Debt Relief has been very helpful. They negotiate with creditors so quickly and has brought down my payments to a lower amount. I would recommend Freedom Debt Relief to friends because if they can help me that quick with my debt problems they can help them. Thank you Freedom Debt Relief for your help. Bad things happen to good people. Life not going the way we plan, defying all of what good stewardship is all about. I was asking for refinancing or personal loan to possibly repay at lower interest. But, I couldn’t find a yes...and started praying for some insight on what to do. I don’t know everything. I was on the Facebook feed when FreedomDebtRelief literally popped up, as if it took the place of what was there before at that millisecond. I called, spoke with Jaime Miranda. He was awesome, helping me through shame and humble humility that I couldn’t stay afloat anymore, and Jaime proceeded to encourage. I was well versed about each step and what to expect, how to follow the progress on the website, and after a very few months have already negotiated and on my way to recovery and respectfully repaying my debt off...and for way less money had I been struggling for the rest of my life to pay off. I have learned very valuable lessons, and grace and mercy are prevailing! The good thing that’s happened to this good person? Freedom Debt Relief and representative Jaime Miranda... Thankful and in humbled regard. I was so nervous at first and somewhat skeptical. But after seeing how Freedom Debt Relief documents everything in my dashboard, I am at ease. They have always answered any questions I’ve had. I’ve seen two settlements come through and I can’t wait to see my last settlement! I discovered Freedom Debt Relief on my own a few months ago and decided to call just to get an idea of what they were all about. I’m very nervous about companies like this but after speaking with the representative I got the feeling I would be in good hands so I decided to take a chance on them and I’ve been happy with my decision. This company cares about their clients and would work with them to find the right solutions for a debt free satisfaction. I’m very pleased and satisfied and would recommend them 100% to anyone looking for a financial freedom. From the very time of my encounter with Freedom Debt Relief, I was so impressed already with the way my issues on my credit was handled. It gave me some dignity knowing that even though I had such debts to settle, they will guide me and be with me all the way. And I was right, seems like they're really working hard to get my debts settle as soon as they can. I can't wait to be debt free with their help. Outstanding and yes, such great company. They have done everything they said they would do. Nothing hidden. A very reputable firm. I would definitely recommend them. They have been very stress-free to deal with. If you are in need of debt relief, please consider Freedom Debt Relief. It seems like to me that FDR has a tried and true plan for your debt. A lot of times our debt is not our fault. Circumstances dictate debt at times, medical, child care, pet care, and loss of job are a few examples. This program helps resolve these hardships and the staff is very friendly with an air of concern. We've all been there, please consider this program before things get out of control. I am very pleased that I made this decision. I was very stressed in the beginning due to the calls from my creditors, but your staff was very reassuring. At this point, my settlements have been negotiated and I am just paying my one monthly, affordable payment. I am excited to be free of this burden. They seem to be doing a good job. They have already made several settlements and I pay the amount that I can afford. I feel like they are taking care of things, and I am getting things paid. FDR works very hard with creditors to negotiate my debts down to a level I can afford to pay off. They encourage me to make my payments so they can work with the creditors and get me out of debt faster. I appreciate them greatly. I have been happy and the staff was friendly and resolved problems. Would recommend to friends and family. I like the one easy payment plan. Taken out of my checking account every month. They work with their clients. Happy to be a client. Not only has Freedom Debt Relief been a live saving program to get me out of debt in a short period of time, which has had both my wife and myself able to put money aside to do more to enjoy the years that we have together. I had no idea just how supportive FDR would be throughout the process of my debt settlement. They have proactively sent me a roadmap for success for each and every step. Their approach is respectful and encouraging. As the result of their support, this has been a very meaningful experience. The customer support is excellent. I have not talked to anyone that was rude and I do ask a lot of questions and they are very patient with me. They're very knowledgeable. I was getting nowhere so this was the best move that I could've made. It's getting us out of debt and it takes the pressure off emotionally and financially. Freedom Debt Relief is doing an excellent job at helping me with my debt. They stay in contact with me and always let me know what is going on. Freedom Debt Relief has given me a chance to breathe and taken some stress out of my life. They are so very nice and accommodating when it comes to dealing with your account. They are willing to go the distance to help you settle your debts. Signing up with Freedom Debt Relief was simple, fast, and not complicated. I was provided with total information about the program and how they could assist me with my overwhelming debt. Signing up with Freedom Debt Relief was simple, fast, and not complicated. I was provided with total information about the program and how they could assist me with my overwhelming debt. I feel I made a wise choice to work with Freedom Debt Relief. Everyone that I have talked to had been polite and well informed. This is going much faster and smoother than anticipated. Very helpful staff. If you follow the beginning instructions you are given they really get to work quickly on your behalf. Automated deposits in your Dedicated Account are the best choice to ensure your settlement payments continue. Settlements began occurring must faster than I expected. Wonderful experience so far! The customer service is great and the plan we were offered fits our financial situation perfectly. We got our first settlement within 2 months! Super fast! I am very pleased with Freedom Relief and they are working very hard at resolving my debt. Couldn’t be happier. There have been many challenges however we have managed to resolve several of my creditors faster than I thought. It’s been an awesome experience working with Freedom Relief and recommend this office for your credit relief matters. They will work with you diligently. I can finally sleep at night. I feel very confident that I will be debt free soon. Everyone has been very pleasant to work with and helpful. All my questions have been answered to my satisfaction. We do not assume your debts, make monthly payments to creditors or provide tax, bankruptcy, accounting or legal advice or credit repair services. Our service is not available in all states and our fees may vary from state to state. The use of debt settlement services will likely adversely affect your creditworthiness, may result in you being subject to collections or being sued by creditors or collectors and may increase the outstanding balances of your enrolled accounts due to the accrual of fees and interest. However, negotiated settlements we obtain on your behalf resolve the entire account, including all accrued fees and interest. C.P.D. Reg. No. T.S. 12-03825.